Many people still associate Behaviour Driven Development (BDD) and automated acceptance testing with User-Interface tests. But BDD and automated acceptance criteria works equally well for service-level tests, notably for Microservices. In fact, automated acceptance tests for Microservices are easier to write and much quicker to run than UI-based tests. In this article, we will look at how BDD-style automated acceptance testing can be applied to Microservices, with examples using Java, Cucumber-JVM and Serenity BDD. In modern applications, more and more services are provided via web services, where a single service can be used by many client applications. BDD requirements discovery techniques and automated acceptance criteria are a great way to describe and document what these services do. There are two approaches to writing acceptance criteria for web services, and the choice of the most appropriate approach depends largely on the audience – The first approach is to take a high-level, business-language tact, using terms that a product owner could understand. – The second is more low level, more technical, aimed at developers rather than product owners or BAs. Tests like this discuss things that a front-end developer might be interested in knowing, such as JSON fields and error codes. Remember, in both cases communication is key. You write tests, and even more so, executable specifications, for the benefit of someone else. Executable specifications are communication vehicles. If they do not illustrate or explain something about the application, in a way that is useful to the target audience, then they are essentially useless. Both approaches can be effective, but different audiences will benefit from different styles and levels of communication. However, I find the most effective approach to be a blend of the two, using a high-level domain-language style in your feature files, and discuss details about JSON structures, headers and error codes under the hood. This works particularly well with Serenity BDD, where the steps at different layers are recorded and appear in the reports. Let’s look at a practical example. Transport For London publish a number of publicly-available Web Service APIs, providing real-time information for applications about the London transport system. One of these services is to return the list of taxi rakes, either within a geographical area, or within a certain distance from a specific point. Notice that even though we are describing a set of web services, to be consumed by applications and with no UI to speak of, we still reason in terms of how these services will benefit the end user. Both of these features are business-focused, expressed in terms of the needs of end users, using a non-technical domain language. They focus on the stakeholder goals, the why, and leave the what and the how until the next level down. Notice how we are still using business language here, describing the outcomes in very readable terms, rather than describing the JSON data that would actually be returned. We do this for a couple of reasons. Firstly, this lets us focus on the information we are specifically interested in, without drowning this information in a flood of unrelated data. Secondly, it makes the tests more robust – this specification will only need to be changed if taxi ranks were added or removed. However, this approach is more akin to unit testing than acceptance testing, focusing more on the how than the what. We can see what end point we are calling, and what JSON data the response should contain, but we have little indication of what we are looking for, and even less of why. The approach also scales poorly; if the response contains bigger or more complex JSON structures, the Cucumber scenario quickly becomes unwieldy and hard to read, which defeats the very purpose of Cucumber scenarios. Nevertheless, it is often useful to see the JSON requests and data involved in a Microservice test. In the rest of this article, we will see how we can use a business-focused approach to describing Microservices, but still benefit from living documentation of the JSON requests and structures, using Serenity BDD. Let’s see how we would automate this first scenario using Serenity BDD. While you can use any Rest client with Serenity BDD, the library provides tight integration with Rest Assured, so that is what we will use here. I won’t reproduce all of the source code for the sample project here, and I’m going to assume a basic understanding of using Cucumber with Java (though the code should be fairly self-explanatory). We will just focus on the interesting bits, including some useful Cucumber tricks that can make your test code a bit cleaner. You can find the full source code on Github. This step simply stores the user’s current location for future use. But even this simple example shows some useful Cucumber features. Cucumber matches the regular expressions in the @Given annotation and passes the corresponding values as method parameters. So the second “(. *)” will be passed to the step definition in the tubeStation parameter (more about that later). We a non-capturing matcher (the one starting with “? :”) to tell Cucumber that we don’t much care about the name of the actor, just that there is one. Non-capturing regular expressions make it easy to write scenarios in a more natural-feeling way. The actual REST endpoints are stored in a central class called TFLPlaces. This class plays a similar role to that of Page Objects in a web test: it’s responsibility is to know how to locate web service endpoints that are used elsewhere in the test. 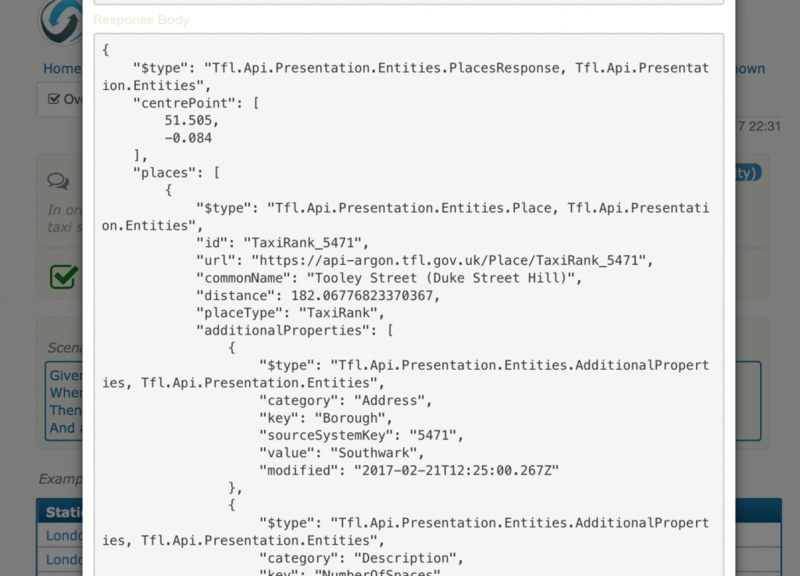 Like many public APIs, the Transport for London API asks us to provide an API id and key, that you can obtain by registering on the Transport for London API site. We use a simple class called APICredentials to read these credentials from a local properties file. RestAssured is powerful, flexible and expressive, but when it comes to BDD, implementing the step definitions is only half the story. We also need to report on what our test is demonstrating. 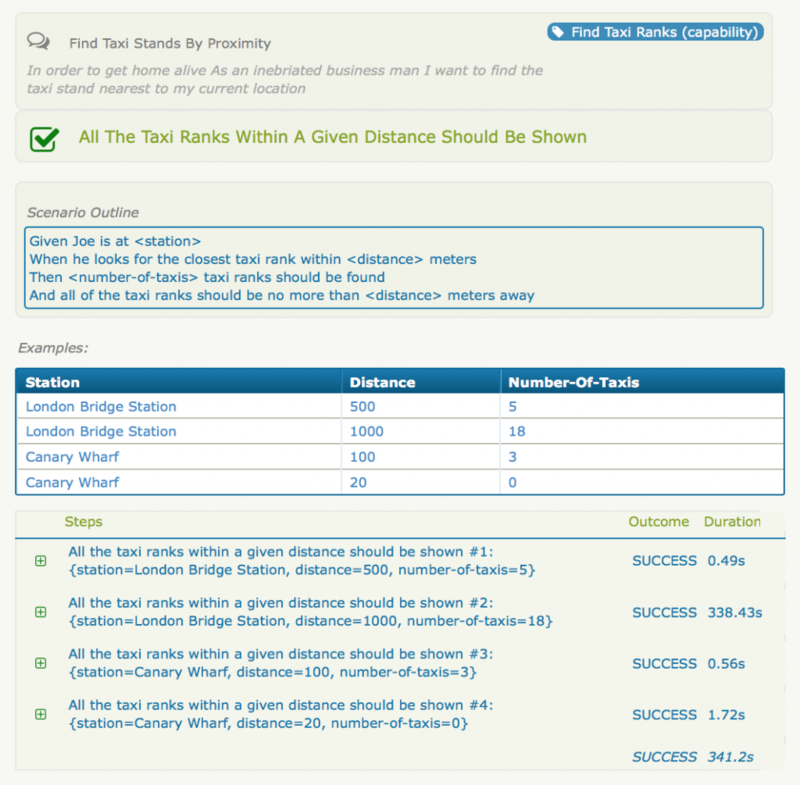 Serenity BDD provides excellent reporting for Cucumber and Rest-Assured based tests. 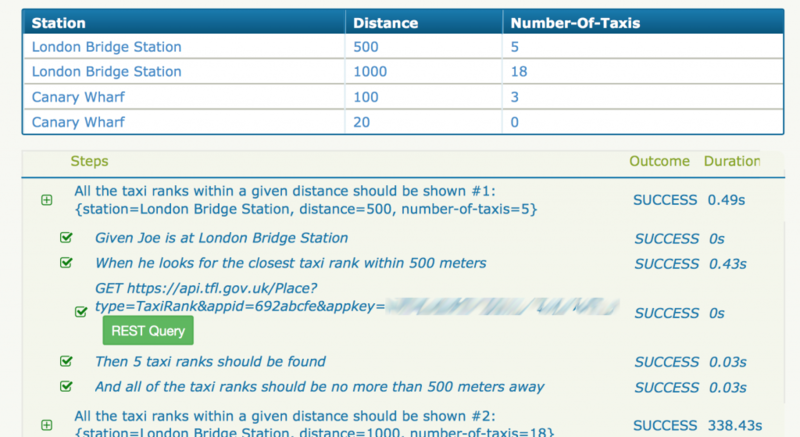 In Figure 1, we can see how the All the taxi ranks within a given distance should be shown scenario outline appears in the the Serenity reports. We can drill down into each individual scenario, as shown in Figure 2. Furthermore, we can view the JSON (or XML) request and response data if we need more details (Figure 3). Behaviour Driven Development techniques are a great way to clarify and document requirements related to Microservices, and to organise automated acceptance tests to demonstrate these requirements. But it is important to remember that BDD shines when you describe the what and the why, and not the how. Thanks to Jan Molak for his review and helpful suggestions!